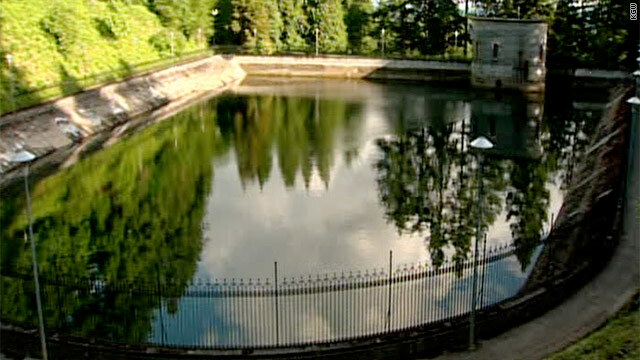 Portland, Oregon's Mount Tabor reservoir holds 8 million gallons of drinking water. Oregon's Portland Water Bureau is draining an 8 million-gallon reservoir after surveillance cameras caught a man urinating into it this week. The move will cost the water bureau $35,000 - $28,000 in lost revenue and $7,500 in disposal costs, CNN affiliate KATU-TV reports. Is that worth it when the urine involved is really a drop in the bucket? Scientifically, no, said Dave Stone, an assistant professor of toxicology at Oregon State University, who spoke to The Oregonian newspaper about the, er, leak. "How many animals are doing that or birds?" Stone asked. "I don't want to second-guess the city, but I can't think of anything chemically that would have me be concerned." Dr. Gary Oxman, a Multnomah County health officer, also told The Oregonian: "The health risk associated with that is really, really tiny." A healthy bladder holds up to 16 ounces of urine, according to the National Institutes of Health. Water bureau administrator David Shaff told KATU it's not about the science. And City Commissioner Randy Leonard told CNN affiliate KGW-TV that the water in the Mount Tabor reservoir is chlorinated before it enters the reservoir. "The water that's in the reservoir that you see is literally the water that you drink," Leonard said. Sgt. Pete Simpson of the Portland Police Bureau told KGW the whole mess didn't have to be. "It's really an unfortunate incident that probably could have been avoided had he chosen a bush," Simpson said. WHAT'S WRONG WITH PICTURE? There's worse crap in water than a few dead body cells. Is there no end to how wasteful a city can be with money that isn't their's to waste? Factories have put worse stuff in our air, but no one is complaining very loudly to shut them down. Oh they after the smoker who's smoke is nothing compared to these factories garbage, but then it's easy to go after a smoker and blame them for all the causes of cancer. Even when people know that's a lie. That is such a beautiful looking container for drinking water, more like a cess pool! If it was anywhere but Oregon I would say the dumping the water was a waist. But Oregon is probably the most water abundant place in America, That reservoir would fill back up with rain in a month or two. So personally I say go ahead, it's unsanitary to be showering with water someone urinated in. The move will cost the water bureau $35,000 – $28,000 in lost revenue and $7,500 in disposal costs, CNN affiliate KATU-TV reports. Just another example of blatant government waste (who have no concerns since it's not their money, and only have to act concerned when elections are near). Ultimately the people are to blame for allowing this stupidity to continue. Ok, does this mean that no one in Portland ever swims in a public pool? How about in lakes – or even the ocean? Know how many fish are doing WHAT!!?? OMG!! in the same water? Does this reservoir have fish in it? If not, has a duck, goose or other waterfowl ever landed in it, or has any flock of birds ever flown over it? Drop another chlorine pill in the water and be done with it – at a lot less expense and waste. I should have remembered to ask: have they done an environmental impact statement to assess the effects of suddenly 8 million gallons of *contaminated* water into the surrounding area? Better check and see if some endangered species of fish has moved in while they weren't watching also. And how many animals will suffer from thirst until it is refilled. A decision made on PR effects instead of health. All that was needed was to get the teen, make lab tests on his urine, and if he was healthy, throw him to the dogs but do not waste 8 mill gallons of good water.